Welcome to the Crowne Plaza Seattle Airport Located across the sky bridge from Seattle Tacoma International Airport and adjacent to the train station, where the light rail train leaves every 12 minutes to downtown Seattle. Take the train to visit the Space Needle, Pike Place Market, Westlake Shopping Center, Nordstroms flag ship store, Century Link, Safeco Field, and the University of Washington. Just beyond our front doors are headquarters of Fortune 500 companies such as Boeing, Microsoft, Amazon, Apple, Google, Tableaux, Facebook and Starbucks. Seattle offers everything from professional sports to hiking up Mt. Rainier, leisure guests planning cruises from Seattle love our hotel's "Park, Stay and Go" package. Join us in Reflections Bar and Grill for a Pacific Northwest dining experience featuring local beers and wine with light bites. Crowne Plaza Seattle Airport has over 12,000 square feet of private event space onsite, with 7 meeting rooms, and two Ballrooms, including our 5,000 square feet Summit Ballroom with 20-feet ceilings. Our dedicated Crowne Meeting Director and banquets team will cater to your every need and ensure your event is a success. Above all, our hotel approach offers guests everything they need for a comfortable stay. From our warm and friendly staff to the full-service restaurant and lounge, Crowne Plaza Seattle Airport hotel is the friendliest and best choice around! Reflections Bar & Grill: Reflections Lounge has comfy seating and an inviting open concept for quiet meetings with colleagues or clients as you sample Washington State wines, local microbrews or our happy hour specials & appetizers, Wide-screen TVs keep you abreast of the game. Gateway Ballroom: Located on Hotel's First Floor, Around the Corner From Main Lobby/Check In. Foyer Area Accommodating (3) 6 ft. Tables for Buffet or Registration. Ballroom is Divisible into (3) Equal Sections of 770 sq. ft. Traditional Conference Breakout Room(s). Summit Grand Ballroom: Summit Ballroom is 5,000 Square Feet with 11' Ceiiling. 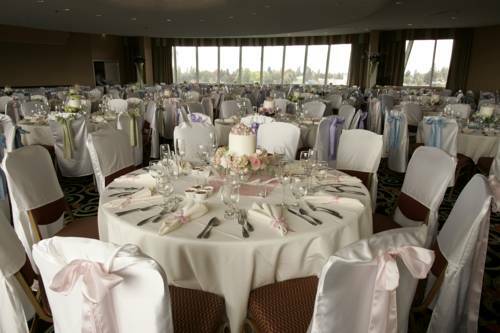 Ballroom offers majestic panaramic views of the Olympic and Cascade Mountain ranges and a dynamic view of the Seattle-Tacoma International Airport. Queen Anne Room: Beautifully Appointed Meeting Room with Chandelier and South Facing Views of Mt. Rainier and Surrounding Areas. Madrona: The new Madrona is a 3212 square foot exhibit space complete with load in and out capabilities and plenty of natural light. The Madrona also has a pre-function space ideal for registration, booth exhibits or even to be used as a separate area for lunch.